Halloween is here and it's an excellent time for creepiness in all forms. Scary movies are a favorite custom but in my house, my daughter and I have a tradition of playing a spooky video game on Halloween. Over the years, we have collected a ton of scary games. Most are your typical cheesefest titles with the predictable jump scares like Five Nights at Freddy’s (my daughter’s favorite) although once in a while, we’ll stumble on games that are just too terrifying to finish. These games usually have an atmosphere that creates more chills than the monsters within — Silent Hill is a good example. I have the top five scariest games we have played already installed and ready to go once it gets dark. If you’re into interactive scares, I dare you to play any of these games with the lights out and headphones on. Independent Polish studio IMGN.PRO released Kholat in 2015. The game is based on the well-documented Dyatlov Pass incident that happened in Russia’s Ural Mountains. The TL;DR version - a group of nine experienced hikers were trekking through Dyatlov Pass when something happened. To this day, exactly what happened remains a mystery. What is known is that the hikers were scared by something to the point that they tore out of their tents in nothing but their underwear and took off running in the snowy terrain. Most of them perished from exposure but three died from strange traumas. One had a skull fracture, another had damage to the brain but no apparent signs of injury to the skull and the third had his eyes and tongue torn out. 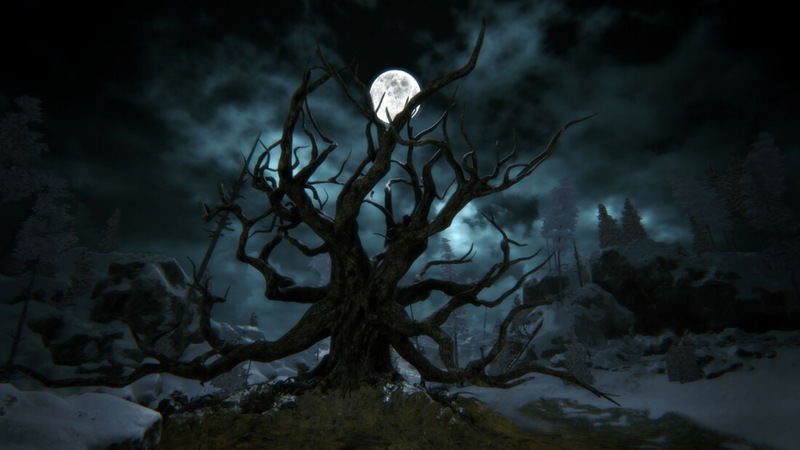 Kholat puts the player in the shoes of an investigator exploring the pass, trying to unravel what happened. The wilderness is creepy and the sounds are even spookier. Tension is built early and paranoia will set in after your first encounter with something strange. The only thing detracting from the experience is the difficulty level of the game. You have no weapons to defend yourself and can only save at campsites which are spaced relatively far apart and not easy to find. What's more, your only means of navigation are a map and a compass. Since the map is just like a real-life map in that it does not show your location, getting around can be a pain. If you get lost (which you will), your best bet is to try heading in the direction of a distant landmark (like a mountain peak) until you find familiar terrain. This can be frustrating and takes you out of the game. Worse than that, if you die, you spawn back at your last camp which could be miles and miles away from where you are exploring. Other than those few negatives, the only other thing that will keep you from finishing this game is the amount of time spent changing your drawers. Games that have you hiding and hoping not to be found tend to do me in. The tension just becomes too much for me. Alien: Isolation is one of those. As the name suggests, it’s based on the Alien movie franchise. There have been many video games based on these films but this is the only one that consistently caused pressure in my bladder. You play as Amanda Ripley, daughter of Ellen Ripley, the character portrayed by Sigourney Weaver in the movies. It is 15 years since your mother and her crew disappeared. You are told that her ship, the Nostromo, has been found and is being held on a space station called the Sevastopol. When you go to investigate, you discover that bad things are going on aboard the remote base — very bad things. Weapons are limited and are useless against the alien anyway (you will use them against other threats within the station). Most of the time, you will be sneaking around and hiding in lockers and such. The atmosphere is not continually creepy so you do get some breathers but when you are being stalked, be sure to gasp for air once in a while. Outlast is another game where you will spend much time running and hiding. There are no weapons (at least not as far as we have ever made it) and it doesn’t appear that they would do much good against the thing that is chasing you. What made Outlast so scary was the darkness. In many areas of the game, the only way you can see (unless you cheat and turn up the gamma) is by using the night vision mode on your camera. Of course, this mode burns through the batteries. Fortunately, it's not too hard to find them (at least, in the beginning). Some puzzles will have you backtracking a bit but they are not too annoying. There are other scares and creepiness to take in besides the hulking monster that is after you so you never know if you are safe, even when it seems your pursuer is gone. This is not officially a game in everyone’s view. Some call it a demo or an interactive teaser but when I first played it, I had no idea what it was. Only later did I learn that it was a mini-game created for the PlayStation 4 by Hideo Kojima and film director Guillermo Del Toro. In P.T., you wake up in what seems to be a haunted house. As you wander the halls, you find that things are not quite what they appear and begin to question your consciousness as well as your sanity. The atmosphere in this one is pretty intense but not too overwhelming. My daughter didn’t want to proceed with it but I managed to finish it on my own. It is worthy of a Halloween playthrough; however, there is one problem. It was meant as a teaser to the upcoming (at the time, but now canceled) Silent Hills. After the eagerly awaited next installment of the disturbing franchise was axed, Konami pulled P.T., a move that ticked off the gaming community. Despite an effort to get the game listed again, it remains unavailable. This one won’t be playable this All Hallows' Eve unless you never uninstalled it. Not to worry though, I will have an honorable mention that can take its place. I have tried multiple times to finish this game but I don’t think my heart can take it. Daylight (not to be confused with Dead by Daylight) revolves around exploring an abandoned insane asylum (I know it’s cliché but it works). Like Outlast, much of the game is spent stumbling around in the dark. There are flares and glow sticks scattered about that each provide a different type of illumination (no spoilers). You can also use the smartphone your character carries as a flashlight but it has limited range. This game is eerie enough with the limited lighting and spooky indoor environment but the sounds… oh, the sounds will raise the hairs on your arms. Headphones are a must for this game. I did make it a fair way through this one but only because I cheated by playing in full daylight and with my headphones off. Hey, don’t judge. It is called Daylight, after all. I assumed that the title was an instruction by the developers on when to play it because there sure isn’t any daylight in the game. Since one game on the list is no longer available, I felt obligated to include this one. Darkwood is another Polish indie title, this time produced by Acid Wizard. The game has been playable in alpha since 2014. It finally reached the beta stage earlier this year and was officially released back in August. The developers created quite a bit of hype by posting a torrent for the game on The Pirate Bay. The move garnered them a ton of free publicity and so far, the reviews are overwhelmingly positive. I agree with most of the reviews and cannot get enough of Darkwood. While it does not hold the same chill factor as some of the others on the list, it still has a creepy vibe and unsettling story that is perfect for Halloween. It plays from a top-down perspective. That limits the scare factor but it works well with the story. You start out in a cabin in the woods with clues all around as to what is going on. It’s a little disorienting at first and even more so after the first plot twist but you get the hang of it quickly. You will find yourself pulled into the story even without the AAA visuals. It’s definitely a game worth playing, Halloween or not. These are the top five (six) games you should play while the ghosts and ghouls are prowling the streets tonight. All of these titles (except for P.T., of course) are available on Steam for under $12.